I bought a T-shirt at a homeschool convention that says, “Homeschool Teacher: There is no substitute.” I thought it was cute and poignant. For most homeschool families, there’s no one to call in when Mom or Dad is under the weather. School may have to be put on the back burner while the primary teacher is recuperating. For instance, I have a severe cold. So for the past few days, I’ve been making my kids read books aloud, while I lounge in misery on the couch. Then I toss a couple of math worksheets at them and call it a school day. A parent can fairly easily work around a few days of sickness. Some activities may need to be rearranged. Grandma may need to be called in for reinforcement. The non-teaching parent may have to chip in a little more. It’s not going to be disastrous for the school year if you are sidelined by a few days of illness. But what happens when the illness or injury lasts longer than a few days? In the fall of 2012, I had a life-altering situation. I went to the emergency room with intense abdominal pain and ended up with a cancer diagnosis and an emergency surgery to remove the large tumor that was causing the pain. It took me five weeks to heal enough to be able to sit upright for more than an hour. It took me a few months to feel like a normal human being again. Had I chosen to do the recommended chemotherapy treatment, who knows how long the recovery period would have been? I am extremely fortunate to have a large, loving family. My mother and sisters took care of me, my kids, and my household for as long as it took for me to get back on my feet. I also had lots of help with food and other essentials from other family and friends. Of course, school was not our main priority during that time, but my family and friends did all they could to keep my kids occupied and engaged in activities, so that they wouldn’t worry about me, and I wouldn’t worry about them. Once I felt like we could get back on track with our schooling, it took a while to build up the momentum we had previously established. Some of my original plans seemed overwhelming since I was really trying to concentrate on reestablishing my own health. Once again, my family came through for me and helped me accomplish my goals. One sister even went through my whole science program and gathered up all the materials we would need for all of our physics labs for the whole year. (Typing this makes me tear up.) She put everything in a huge bag and labeled it all according to each lesson number. My sister doing a science experiment with her children and mine. I often wonder what would have happened if I did not have this security net around me. What would our school year have turned out to be if I hadn’t had so much help? I may have chosen to send the kids to public school temporarily. I may have tried to persuade my husband to school them in the evenings after his long day at work. I don’t think that would have panned out, because he’s not a teacher-type at all. I may have just cut out the majority of my plans and stuck to the bare bones basics. I’ve read other blogs and homeschool forum chats where families have had to make tough decisions like these. My heart aches when I read about a family who has to change their entire lives because of a serious illness or injury. Our family missed a couple months of schooling because of my illness. My very carefully planned year was thrown off course. We cropped activities, read fewer books than projected, and skipped a few lessons here and there. In short, we adapted to the situation. Even though it was not what I had envisioned, when it came time for our year-end portfolio review we had a decent school year to discuss with our assessor. It has been almost a year and a half since my surgery, and I’m doing well. My perspective on school and life has certainly changed. My priorities are more about my kids enjoying this time with me than on finishing our math book “on time.” I want my kids to be prepared for whatever life brings to them in the future, so I still focus on providing them the classical education I think will serve them well throughout their entire lives. However, I now spend a lot more time worrying about making good memories with my boys than I do about the things they should accomplish in our school year. 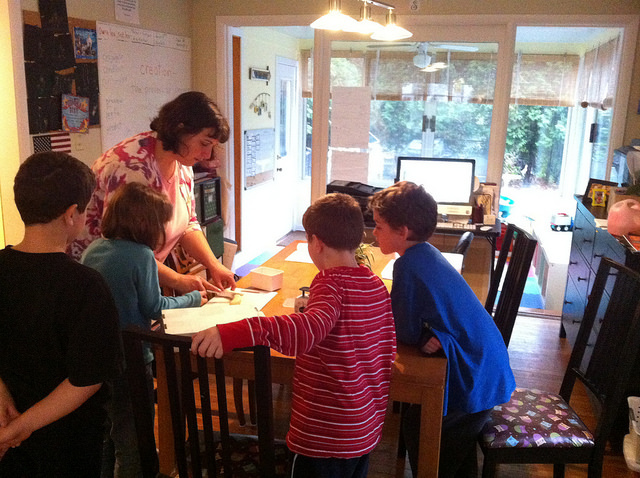 After giving public school a brief try, Lynne and her two sons have decided they are really more of a homeschooling family. Her older son is a humorous fellow with high functioning autism, who thrives in a home education environment. Her younger son is a sensitive soul with a great deal of patience. The boys, Mom, and Dad, along with the two guinea pigs, live in Northeast Ohio. Lynne holds a Master’s Degree in French Language and Literature. She is also a Harry Potter fanatic, enjoys line dancing and Zumba, spends hours scrapbooking, and loves organic vegetables. You can visit her soon to be revitalized blog at http://www.daysofwonderhomeschool.blogspot.com . Next Why Classical Education? High Standards, Customized, by Jen W.